I made this background in my art journal recently. Nice huh? I did it by spreading the paint with a plastic card, as learned by Nancy in her post Easy as pie background that she wrote in June! I’m not fast, but I have a good memory and when I see something I like I kind of add to my virtual list of ‘To Try’s. I didn’t use as many colours as Nancy, and I kind of smeared all the colours together into a fire ocean of red, orange and yellow. But oh, how I love this method! And the surface is so smooth – great for writing on! Love it, and will use it a lot more! This is how the final page look. This entry was posted in Art journaling, On writing. Bookmark the permalink. Hanna, this is so inspiring! 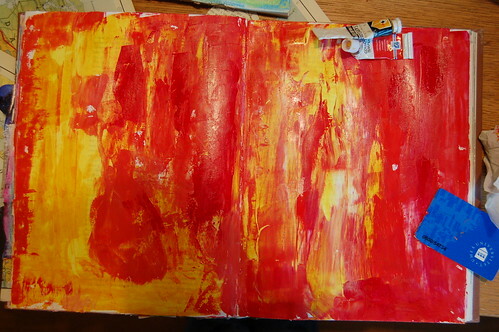 I love the idea of spreading paint across journal pages – I’m going to try this soon, I just have to! 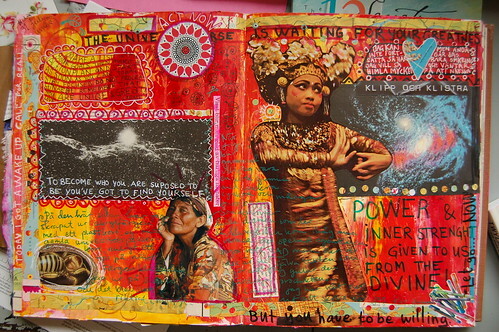 Thanks for sharing your process and your ups ‘n downs of doing an art journal. I keep more of a scrapbook than a journal; it’s notes from art classes, ideas (mostly images from magazines or printed off the web and glued in), color schemes (again, images glued in), some quotes from various sources, and whatever I find inspiring. I love the background and the divine text you wrote. Very cool. I have a hard time with some paper holding up to paint without falling apart but if you glue stuff on top that helps I think. Thanks for sharing your spread! This is fabulous! I so need to try the credit card painting technique … I have a huge stack of them waiting to try it, but just haven’t done it yet. I will have to pull one out and try it asap … you’ve thrown down the gauntlet LOL! And I love how you filled the page … it’s so full of movement and energy. Your use of several different colors of ink for the various bits of journaling and doodling really add to it. Just wonderful! This is just beautiful. Thank you so much for sharing! Wow, I think this is one of the best pages I’ve seen you do. It’s lovely. I don’t use a brush at all, I use a sponge, the same as we use for dish washing. I learned that from Celine Navarro, and it’s great. I also don’t clean it, because it absorbs the colors, so I can just use it for a whole page, and clean only when I’m done. I like the plastic card technique, Lisa Volrath also uses it. I have to try. This page turned out beautifully. I’ve been wanting to try art journaling myself, and have also found it difficult to decide what to write. I guess it really is better to just write what comes to you because, well, it’s a journal. Hey, Hanna! I love this page! But don’t worry about what you write on your pages. You don’t have to record deep thoughts. No one is going to read it and say, Gee, you don’t write the right things in your journal! There’s no right or wrong. Anything goes in your journal…it’s what you want it to be. Write lists, random thoughts, song lyrics, or nothing at all. I’ve seen a lot of journal pages with no writing. There are no rules! This journal page is so alive with your color and images! I don’t keep a journal consitantly but we are taking a trip soon and I am preparing my journal pages (and will try this! color technique) so I hope to fill it up! Thanks for the nudge LOL! I can’t wait to work with these new backgrounds. I LOVE your art work . Can I give you a place on my favorites ??? I hear from you ??? I love these pages! The pictures you chose are outstanding and the fire colors really brings them to life. I feel your pain about writing over paint. I’ve vowed myself to actually JOURNAL in my journal. Now I have another excuse to avoid my homework tonight…I have to try that credit card technique! Wow, this spread is incredible. I can see the joy and love just pouring forth; what a full and excellent creation.